Used Apex 115- $69.99 Mint Condition w/clip The Apex115 is a premium quality hypercardioid hand-held condenser vocal microphone with exceptionally smooth frequency response and high sound pressure level capability. Used for professional sound reinforcement, recording applications and broadcast, the Apex115 delivers studio quality performance with the ruggedness needed for live stage. Features The Apex115 features a smooth low-frequency roll-off that compensates for proximity effect offering a more controlled bass response. Crisp top end, tight midrange and predictable proximity effect characteristics mean the Apex115 performs amazingly well in demanding live vocal applications, with digital recording systems, computer-based studios and high performance analog recording systems. The Apex115 requires phantom power to operate, and has a frequency response of 70 to 18,000Hz, and a 65dB signal to noise ratio. It is shipped with a custom fit mic clip. The APEX190 is a professional, stubby flat-frequency response cardioid condenser microphone suited to many applications. 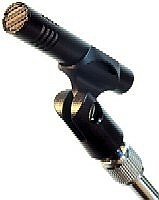 It can be used as a source microphone for choirs, for string sections, background brasses or drum overheads. It also works extremely well on acoustic guitars, in tight on hi-hats, or for solo string or woodwind instruments. The mic is enclosed in a rugged, low reflectance matte black finish making it ideal for instrument micing in any studio, broadcast or live applications where a high performance overhead mic is required. The APEX190 requires phantom power to operate, and is shipped with a microphone clip and windsock. The APEX110 is also the ideal multi application, compact studio condenser microphone. For the budget conscious studio owner looking for one all-purpose condenser, the APEX110 is great for vocals and easy to record with. Crisp top end and predictable proximity effect characteristics mean the APEX110 performs amazingly well with digital recording systems, computer-based studios and high performance analog recording systems. It also can effectively be used for recording woodwinds, strings and acoustic guitars. As a live sound reinforcement mic, its compact size, light weight, and impressive specifications make it the mic of choice on lecterns or in any broadcast environment where performance is required from an unobtrusive source. The APEX170 is designed for use in any live sound reinforcement or recording application where a tight, controlled pickup pattern is preferred. The APEX170's cardioid polar pattern reduces unwanted background noise and feedback potential. Its smooth response and clear imaging make it an ideal choice for acoustic instruments like violin, viola or guitar. With a frequency response from 80 to 15,000Hz, it also suits cello, background brasses or acoustic basses where isolation and performance are needed. The APEX170 is also a very cost-effective solution to overhead mic'ing a drum kit, or micing the area around a percussionist. The APEX170 also has the ability to power its electret condenser capsule with phantom power OR a single 1.5V AA internal battery when phantom power is not easily available. The APEX350 is designed for vocal applications and features a high energy, rare-earth neodymium magnets, double dome-diaphragm and an aluminum alloy voice coils for incredibly high output levels with warm tonal characteristics. Its directional pattern maximizes gain before feedback for better on-stage performance. An extremely rugged, heat-treated metal grille complements the solid "feel" of this low impedance microphone. Features The APEX351 features a patented one-piece cartridge with a single shockmount system, which maximizes durability and shock resistance while ensuring proper alignment between the delicate components, and reducing extraneous noise. Also, a filter minimizes breath noise and popping caused by hard consonants. APEX351 has a new leather-feel finish for more positive grip during enthusiastic live performances.